If it looks familiar – that’s because it is. The JAC cab is previous generation Isuzu NPR-based. LIKE the birth of an elephant, or the roll-out of the NBN, it's been a long time coming. But the JAC range of Chinese trucks is finally on the road in Australia and stocks of most models are heading out to the dealer network right now for sale from September. The 4.5-tonne to 7.5-tonne GVM sector is highly competitive, with slim margins, frequently very old trade-ins and some keen finance deals available. So dealers need to be experienced and agile in dealing with all facets of a truck purchase, not just importing a spec that looks good and hoping for the best. The trucks are available through a national network of 20 dealers, most of them established truck outlets with existing competitive franchises. It's fair to say the current manufacturers at these sites are unimpressed, for obvious reasons. There are three initial model variants, starting with the entry level J45 at just $36,389, significantly below the pricing offered by its closest Japanese rival. The national distributor, Sydney-based WMC, provides an industry-leading warranty, with the driveline warranty extended to five years, which should boost customers' confidence in the decision to commit to the JAC product. JAC is one of the world's largest truck manufacturers, with annual production of 400,000 trucks, more than all of the Japanese truck manufacturers combined. 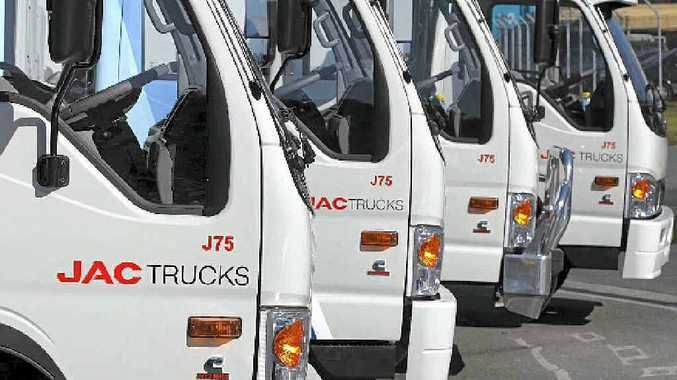 During a visit to the factory nearly two years ago, I was shown a much wider range of trucks than are presently available here, and WMC has indicated it will be sourcing additional products from JAC as the business builds and the brand name gains acceptance. "While we know we have a clear price advantage, our proposition is about much more than the sticker price, it will be about whole of life cost of ownership and confidence in the product," CEO of WMC Group Jason Pecotic said. "It will mean that JAC buyers will enjoy the confidence that they have purchased a truck that will be reliable, cost effective and have the after sales back-up that matches anything else in the market." Leading automotive dealer groups including AHG, CMV, Adtrans and Macquarie, along with major independent dealers, make up the dealer network for JAC in Australia with apparently more dealers in the process of signing agreements for the new brand. The Euro 5 SCR Cummins ISF engine platform used across the JAC light-duty truck range starts with the 2.8-litre 110kW and 360Nm version in the J45. The J65 and J75 have a 3.8-litre version with slightly less power, 105kW, but a lot more torque, 450Nm. A ZF 5-speed manual gearbox is standard in the J45 and JAC's own 6-speed manual is in the larger trucks, there are no autos or AMTs at this stage. The J45 and J65 have a 2.5-tonne towing capacity and the J76 is rated for 3.5-tonne. The two larger trucks are the only light-duty trucks on the Australian market to have full air brakes as standard. Standard features on all three JAC light-duty models include ABS anti-lock braking, EBD, power windows, air-conditioning AM-FM-CD-MP3 audio system, remote central locking, door pockets, cup holders and entry assist handles. WA Hino has the nod as the first WA dealer, and we'll have a road test soon.